I know January's a tough year for all of us financially after the over indulgence of Christmas, the January sales and so on but if you can spare a few pounds to help Haiti then please do so. 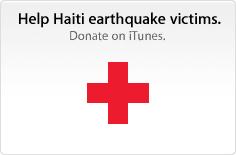 You can donate to The Red Cross via iTunes. You can pay in amount of £5, £10 and so on.